Friday evening, September 28, the support groups made their way down the dark corridor to the boxing ring inside the brand new 40,000 sq. ft. Pechanga Summit Event Center at the newly remodeled Pechanga Resort & Casino. 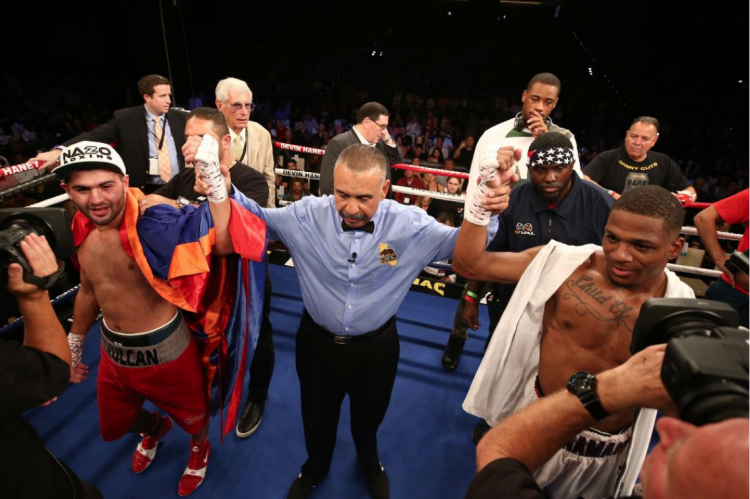 First, it was the Juan Carlos Burgos led group from Tijuana (r) followed by the opposition led by Devin Haney (l) from Las Vegas. At the outset of this title fight, it’s likely the 19-year-old Devin “The Dream” Haney (19-0, 13 KOs) was asked to use his maneuverability, quicker hands, and counter-punching to establish a comfort zone, while circling the ring. When Burgos (33-2-2, 21 KOs) managed to cut off the ring, Haney then surprised his detractors by standing toe to toe with the revered veteran. After getting more and more comfortable, Haney demonstrated his ability to stay in the pocket, employ the Mayweather shoulder roll and dodge Burgos as if he were a matador. His ability to take a punch, escape, or use his blinding speed to surprise Burgos caught the Tijuana fighter flatfooted. By the end of the sixth round, this observer had Haney ahead four rounds to two. As you can see there was very little in the highlight reel to favor Juan Carlos Burgos (white trunks, blue stripe) who was on the receiving end of 133 shots to the head while landing just 40 headshots. After finding little to moderate success early on, Burgos finally began to land some solid blows to Haney’s body in round seven; no doubt he was prompted by the urging of his corner who bitingly opined, “C’mon, where’s your heart?” Once again, this had Haney back on his bicycle circling the ring. His offensive response was to suddenly stop and counter, hitting Burgos in the head, which evidently impressed the judges more. Burgos would not be deterred as he kept up his attack on the body as if pounding Haney’s midsection was his only recourse. On rare occasions, it did slow Haney down, but like a racehorse that knows when it’s time to pour it on heading into the home stretch, Haney kept doing whatever it took to impress the judges right up until the final bell. 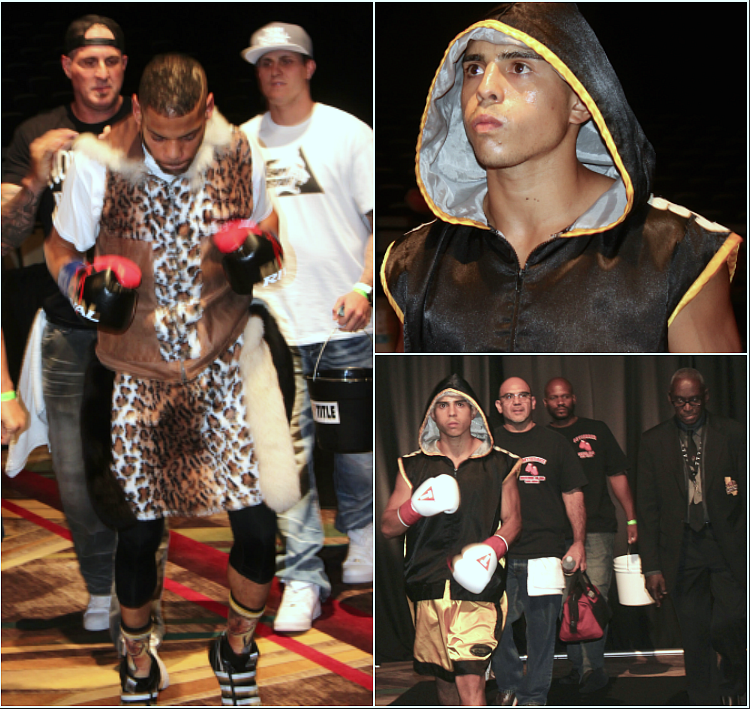 Round #7: this was one of the brief periods when Juan Carlos Burgos actually found himself in control of the fight. This comfort zone didn’t last long. In the 8th round, Burgos again found moderate success when targeting the body with left hooks and using an occasional left uppercut. Despite the shots to the body, Haney kept circling and kept countering from a safe distance. 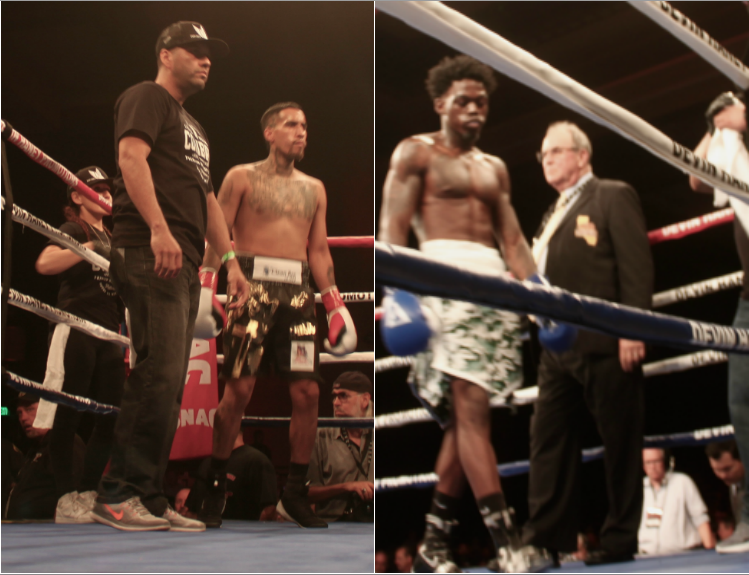 After 10 rounds, one judge scored the bout 97-93 (which your humble servant also had) while the other two judges seemed less discerning and gave every round (100-90) to the show’s promoter Mr. Haney of DHP (Devin Haney Promotions). That last sentence sounds a bit brash. As my father used to say: “Whoa! Hold your horses!” Haney’s dream of invincibility appears to be a few years off. Adolescents, like this young 19-year-old, take risks to test and define themselves. Like any teenager, he’s a thrill seeker who at this point might just press down on the pedal and drive a sports car at 110+ miles per hour. Risk-taking can be both beneficial and harmful. It can lead to situations where new skills are learned and new experiences can prepare them for future challenges. But it can also be harmful. Hopefully, for Devin Haney’s sake, he’ll continue to listen to the advice of his elders, his father William Haney Sr. and trustworthy confidant Floyd Mayweather Jr. 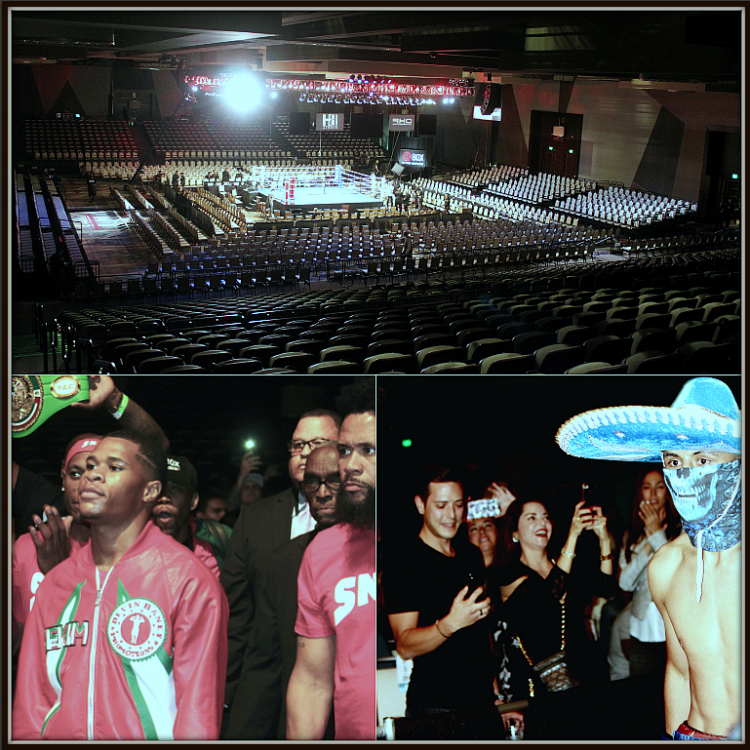 The opening bout of this Showtime Showbox: the New Generation boxing extravaganza, Bout #3, had heavyhitter DeAndre Ware (left) (12-1-2, 8 KOs) doing battle with Cem “Champ” Kelic (12-0, 7 KOs) (r) who in the photos above are making their way to the ring. 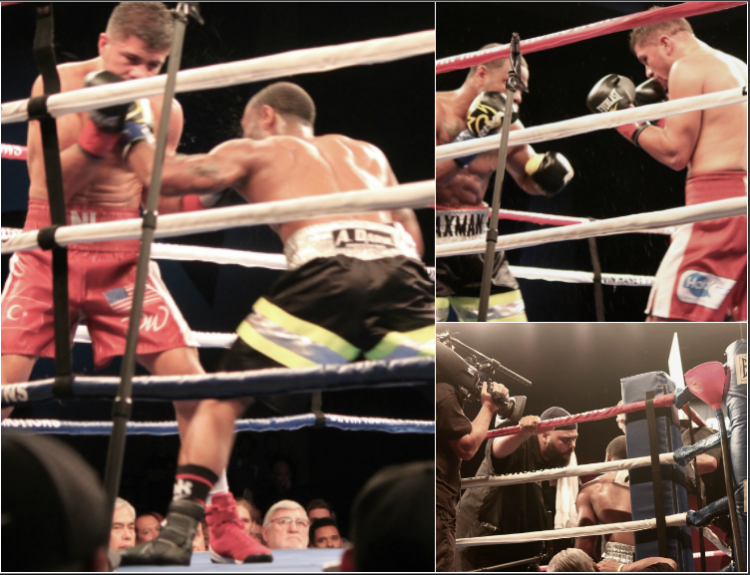 (photo, bottom right) By the sixth round, the writing was on the wall and DeAndre Ware’s trainer began pleading with him, “You’ve got to stay busy, get better leverage on your punches and land the big one to stop this guy. Ware found it difficult to explain this guy’s unstoppable. The 24-year-old Cem Kelic from Sherman Oaks, Calif. by way of Frankfurt, Germany, simply out-worked the 30-year-old DeAndre Ware from Toledo, Ohio in their most entertaining, super middleweight clash, which featured by far more offense than defense. In this bout, 1,418 punches were thrown and nearly 500 connected squarely. It was one of those last man standing contests where Ware would let loose and then Kelic would respond with his own barrage of right on the money punches, the majority of which were brutal. Midway through their bout, it became obvious Kelic (left) was keeping better track of the number of punches landed and after eight rounds, all three judges were in agreement. Ward (right) was out-hustled by Kelic who no doubt has a granite chin. 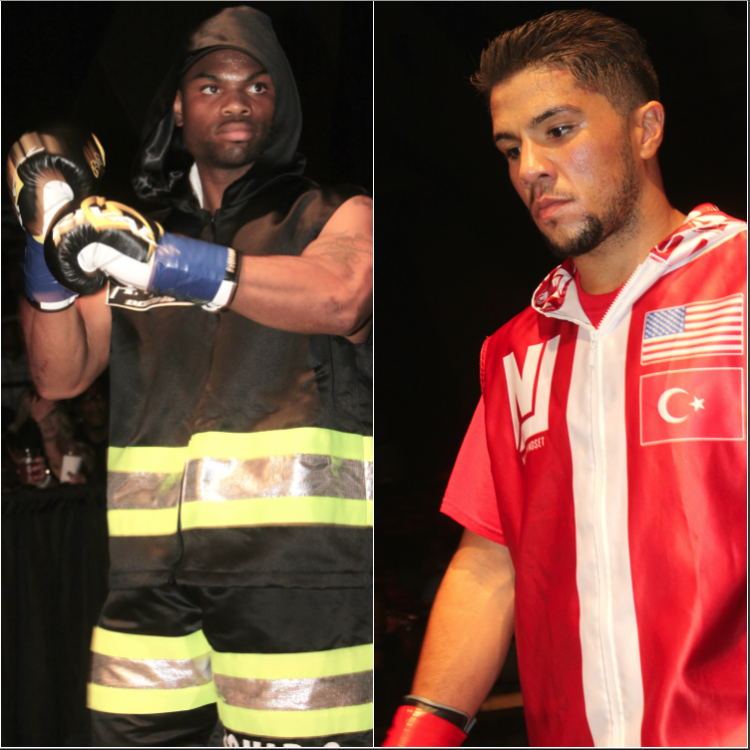 Bout #4, the rematch between super lightweight rivals Thomas Mattice (13-0-1) and Zhora Hamazaryan (9-1-1) was next. 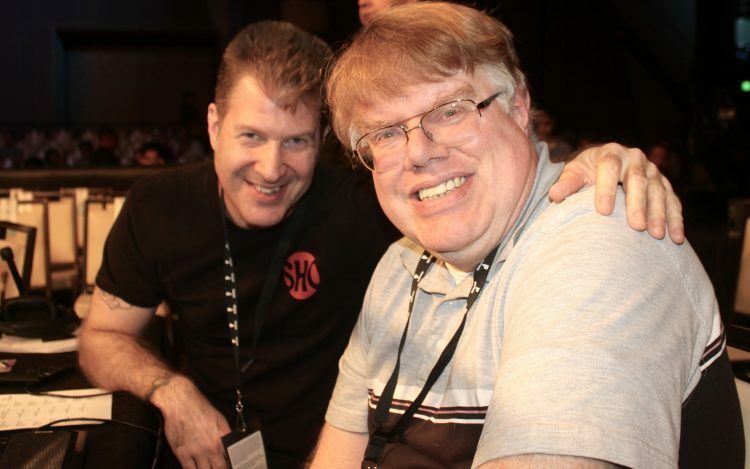 Back on July 20, 2018, these same gentlemen fought and the victory was awarded to Mattice, even though the fans at the venue, the Winna Vegas Casino & Resort in Sloan, Iowa, the social media who watched at home and even the Showtime Showbox announcing team voiced their disgust with the decision. The witnesses and even Showbox were hoping this revenge match would set things straight. Lot’s of luck with that pipe dream. With the momentum once again shifting from Hamazaryan to Mattice, you had Hamazaryan winning the early rounds, and then Mattice doing much better in the latter rounds. With the fight reminding some of that movie “Ground Hog Day” starring Bill Murray, onlookers began to wonder if the same, identical scenario might occur. How could this be possible? Hadn’t Hamazaryan been the aggressor throughout and didn’t he lead in the Compubox stats (150 to 93 in total connects) and wasn’t he the more active boxer (throwing 525 total punches compared to Mattice’s 305)? Sure, but Mattice’s clever, preferred tactic involved being more mobile and picking his spots to counter effectively. 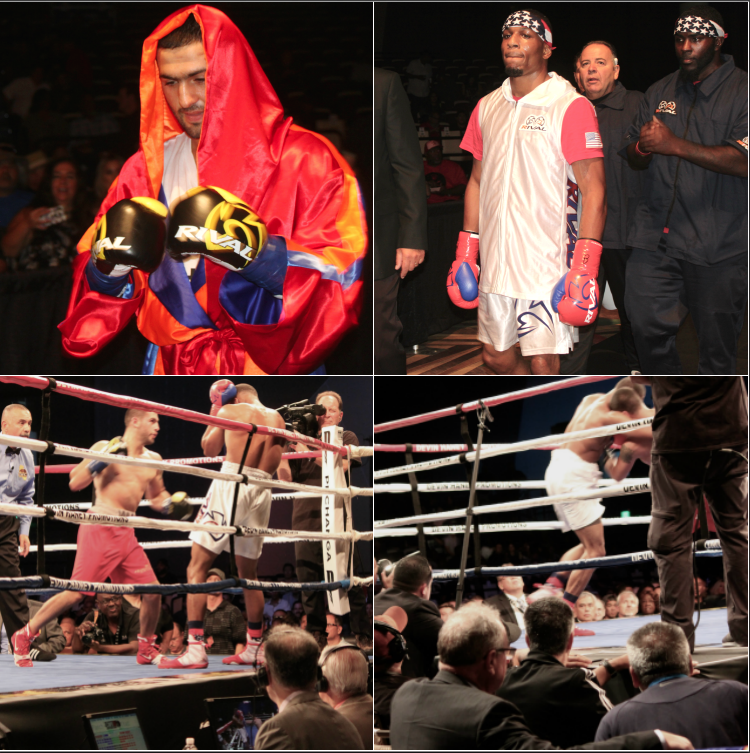 Combatants in Bout #4, Zhora Hamazaryan (top, left) and Thomas Mattice (top right) make their way to the ring. Then, as if asked to duplicate their efforts from their last fight, both fighters proceeded to do just that and the judges obliged scoring the bout a Draw. After eight full rounds, judge Sergio Caiz had it 77-75 for Mattice, judge Edward Hernandez Sr. scored the bout 76-76 a Draw and finally judge Alejandro Rochin scored the bout 77-75 for Hamazaryan preferring his pressure tactics to make the bout a split decision Draw. 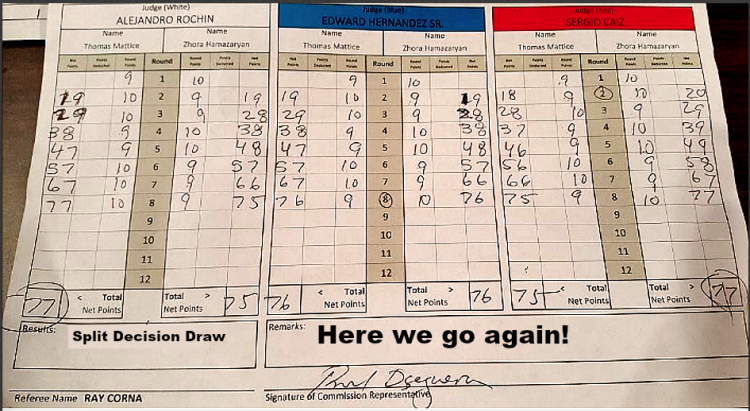 For your eyes only, the Calif. State Athletic Commission’s dreaded scorecard showing the Split Decision Draw verdict for Thomas Mattice (13-0-2) and Zhora Hamazaryan (9-1-2). Question for Showtime, can we now expect a third fight, a trilogy? After four competitive rounds in the show’s opener, Bout #1, it was Temecula, Calif. welterweight Anthony “The Future” Franco (2-1-1) and Denver, Colorado’s David Payne (2-1-1) battling to a draw. Payne got off to a quick start but then the better conditioned Franco rallied back in the final two frames to pull even. All three judges were in agreement and scored the bout an identical 38-38 Draw. (photo top) Well known boxing trainers (l to r) Henry Ramirez of Riverside, Calif. and Joe Vargas from The Arena in Point Loma, Calif. flank their fighter ex-Marine Anthony “The Future” Franco of Temecula. (bottom, right photo) the two disappointed boxers have their hands raised after the anouncement of a unanimous decision 38-38 Draw. Bout #2 between Haslett, Michigan’s Kevin Shacks (3-2-3, 3 KOs) and San Diego’s Ricardo Valdovinos (7-0, 5 KOs) ended just as the closing seconds were being counted down to end round one. In their don’t blink first round, both gentlemen were throwing leather as if there was only one round. After one mean uppercut from Valdovinos, came an even meaner rabbit punch to the back of Valdovinos’ head. Seconds before the timekeeper gave the signal that there were just 10 seconds left in the round, both men were entangled and spinning about as if on one of those dizzying rides at an amusement park. 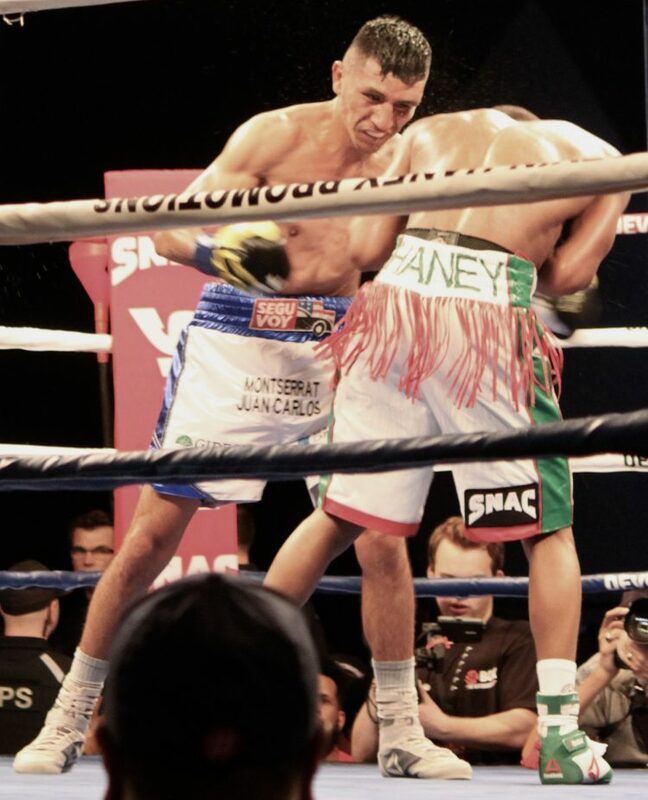 Shack’s next punch was a set-up punch – a soft left jab to hide the second punch which was the killer, a solid, accuracy plus overhand right that landed flush on the left side of Valdovinos’ chin and down he went. Shacks’ lightning fast, one-two delivery caught Valdovinos unprotected at the 2:59 point of round one. Just prior to the start of round one in Bout #2, we see Ricardo Valdovinos (l) and Kevin Shacks (r) nervously awaiting the start of their bout. The newest boxing strategy involves spinning your opponent around and then catching him or her off guard with a stunning, knockout blow, a strategy that worked for Kevin Shacks. 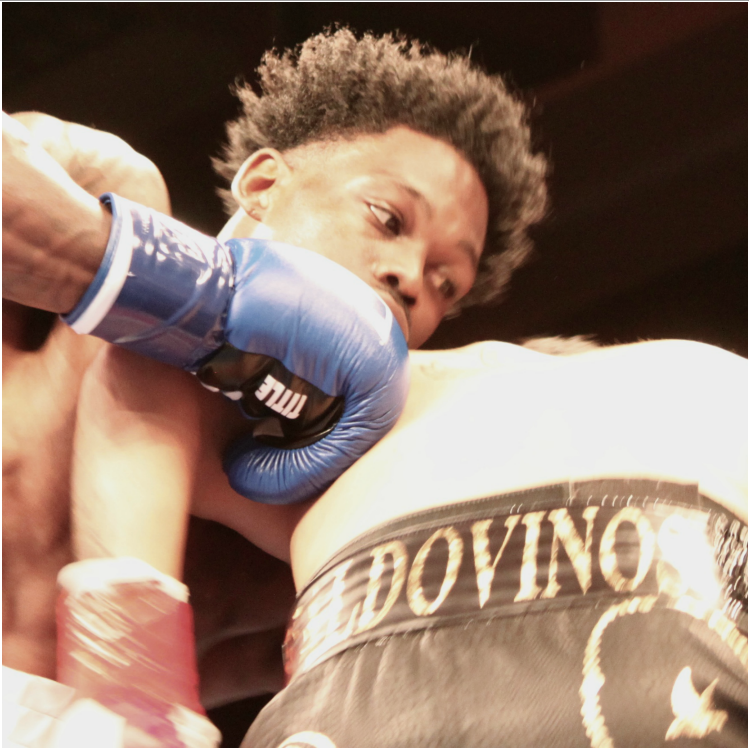 Kevin Shacks, his corner, referee Ray Corona, Valdovinos’ corner plus the surprised fans, were bowled over by this sudden development and looked on in disbelief as the unyielding Valdovinos made his valiant but fruitless attempt to get back up on his feet. 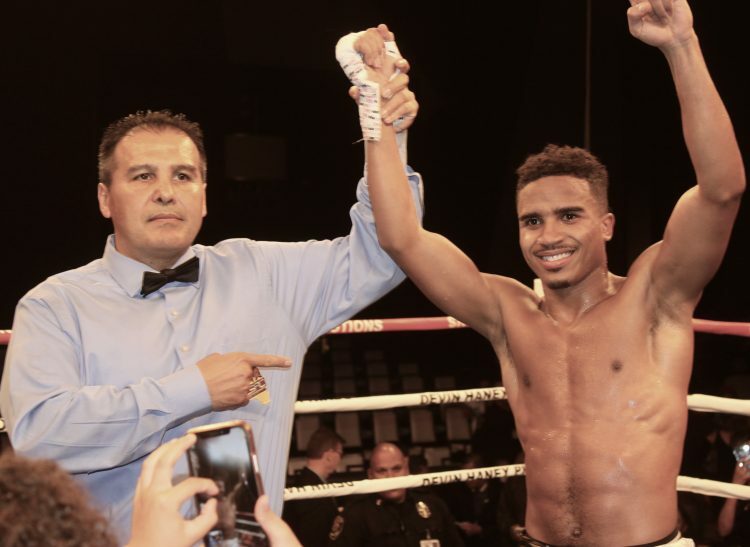 While Ricardo Valdovinos (r) is still sorting out the cobwebs, his opponent, Kevin Shacks (l) is having his arm raised in victory by referee Ray Corona. 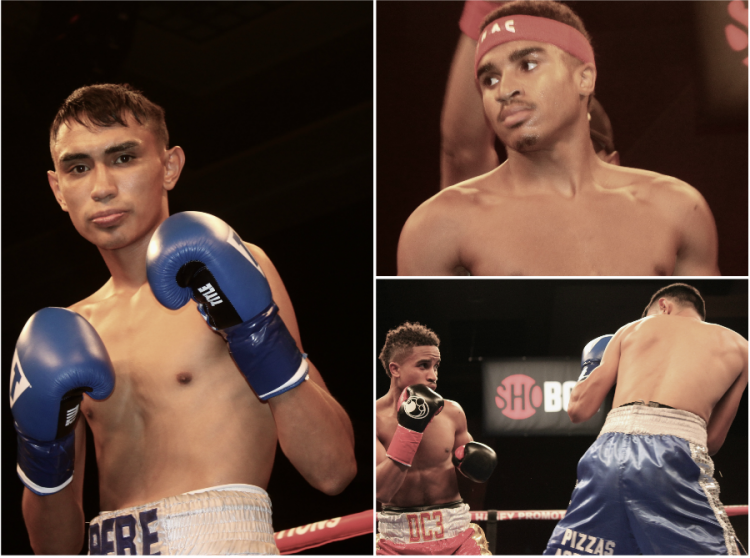 In Bout #6, we saw super featherweight Roberto Meza (10-1, 6 KOs) from Temecula, Calif. have his way against the much shorter Gabriel Rodriguez (4-1, 0 KOs) from El Paso, Texas. As far as deficiencies, Meza appeared to be open time after time for Rodriguez’s overhand lefts to the head. With both boxers speaking perfect English, there was Rodriguez’s corner shouting over and over again, imploring their fighter to keep throwing the same punch and over and over again it would land. 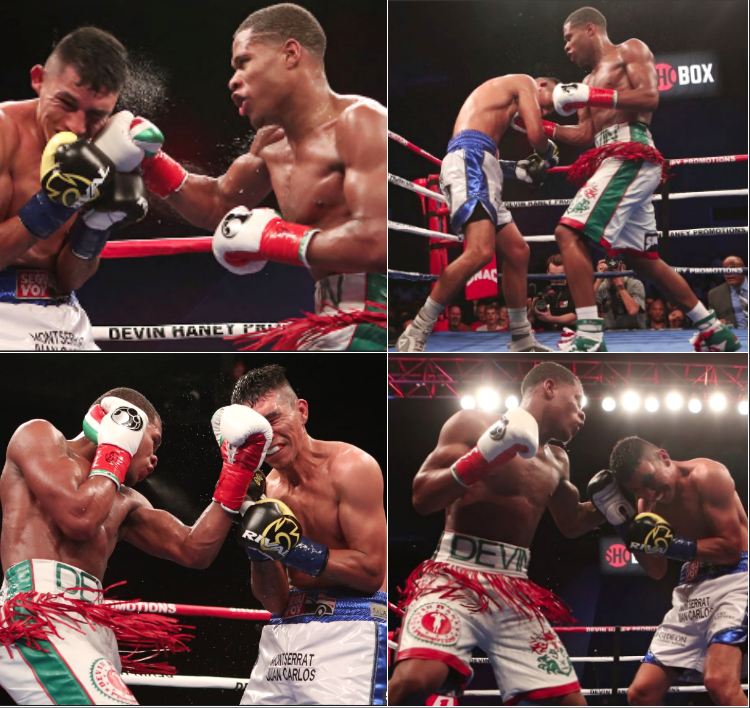 At the very same time, Meza was having a field day landing his much wider variety of punches. 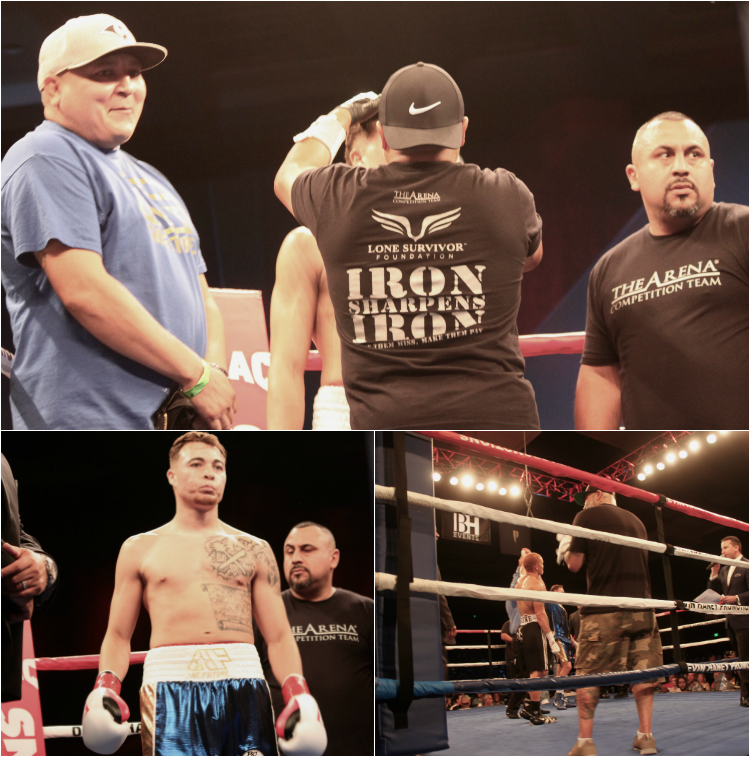 The scoring for this bout was predictable, 60-54 for Roberto “The Ram” Meza on all three scorecards. Regardless, at the end of the fight there was the relentless, never give up, never say quit Gabriel Rodriguez stating he will be back and he wants a rematch. No matter which side you were pulling for, you knew Bout #7 between the 26-year-old Lennard “Cheetah” Davis from Oakland, Calif. and the 23-year-old Adrian Gutierrez from Chula Vista, Calif. was going to be a classic. Bout #7, a six round welterweight match between two well schooled fighters, Adrian Gutierrez (5-0, 3 KOs) and Lennard Davis (3-1-3, 2 KOs) was a classic. Back and forth went the momentum for the entire six rounds and in the end, you could see the dumbfounded look on the judges. This intensely competitive match ended in a majority draw. Judge Edward Hernandez Sr. scored the bout 58-56 for Gutierrez while judges Sergio Caiz and Alejandro Rochin had it 57-57 a Draw. Truth be told: to assign a winner of this contest would have been a travesty. It was that close. 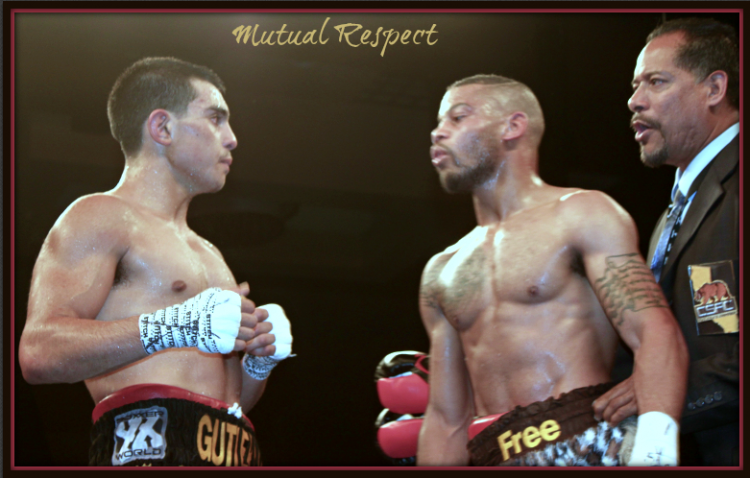 At the conclusion of their bout, you couldn’t help notice the mutual respect between the two accomplished fighters. And to close out the evening, they had Devin Haney Promotions’ protege super bantamweight Darren “DC3” Cunningham III (6-0, 3 KOs) from St. Louis, Missouri taking on Saul “Bebe” Hernandez (10-11-1, 5 KOs) out of Tijuana, B. C., Mexico. 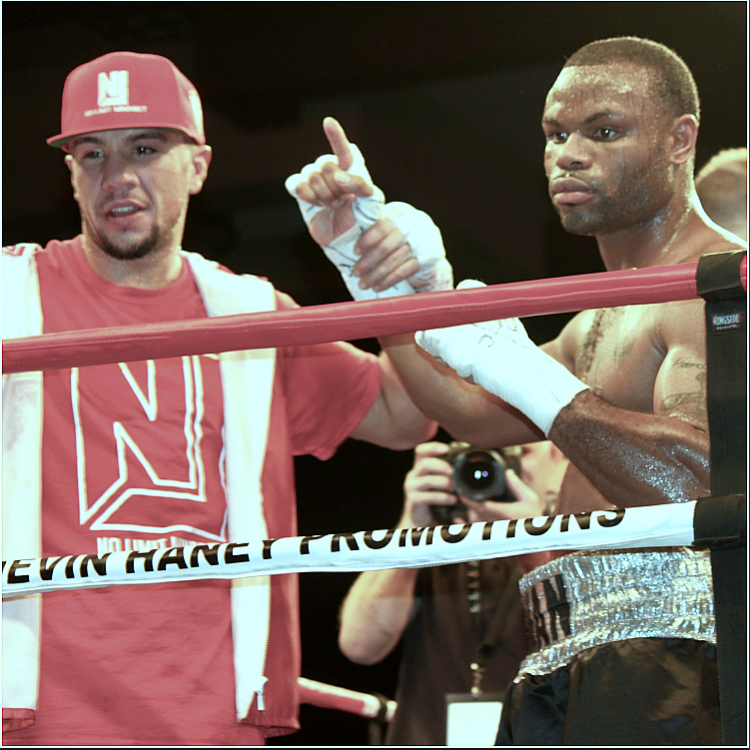 Cunningham, who has been benefitting bigtime from getting to spar with Devin Haney in Las Vegas, looked awesome for most of the bout and then in the closing rounds the more experienced Hernandez made one last valiant effort. 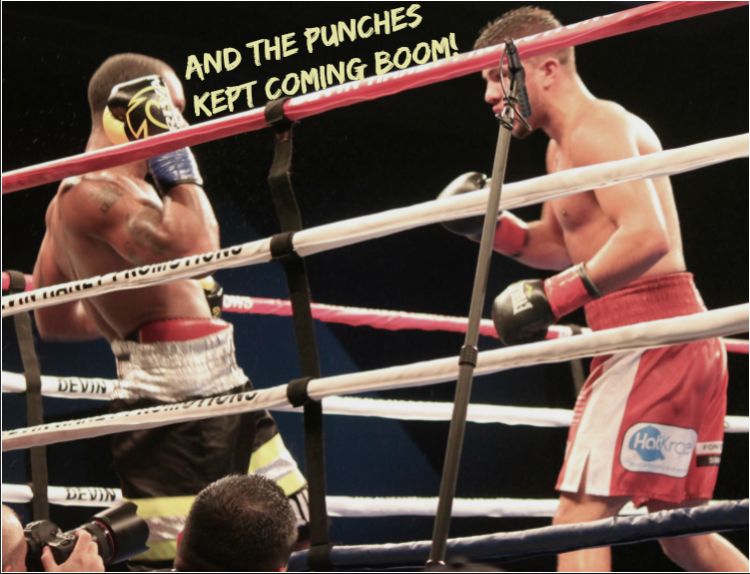 Still and all, at no time did Hernandez land a blow that would jeopardize Cunningham’s unanimous decision victory of 60-54, 59-55 and 58-56. It appears Cunningham may well be a force in the highly competitive, super bantamweight division. 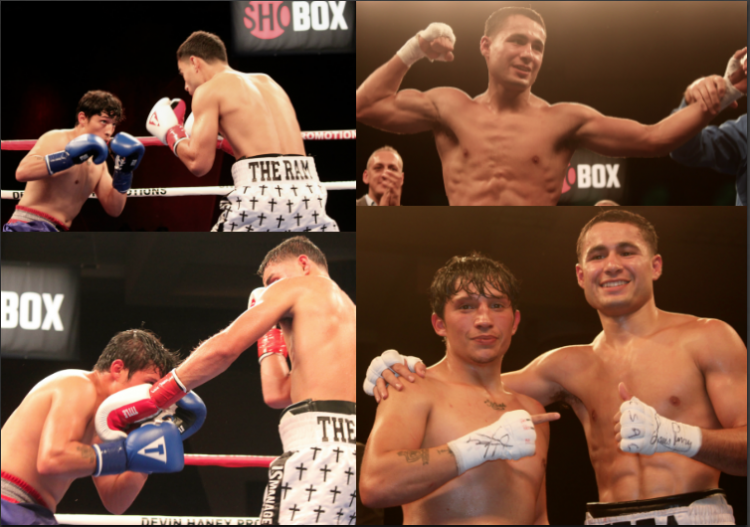 (l) Saul “Bebe” Hernandez from Tijuana, B. C., Mexico and (top right) the flashy Darren “DC3” Cunningham III from Las Vegas, Nevada by way of St. Louis, Missouri. 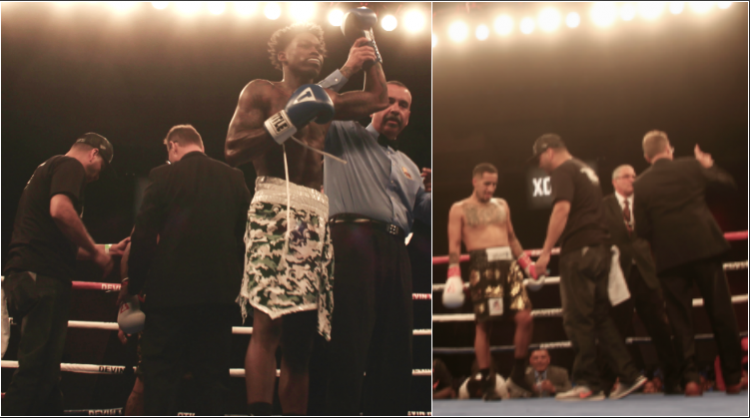 At the conclusion of the Saul “Bebe” Hernandez vs. Darren “DC3” Cunningham III bout we see referee Rudy Barragan raising the arm of the victorious Mr. Cunningham. 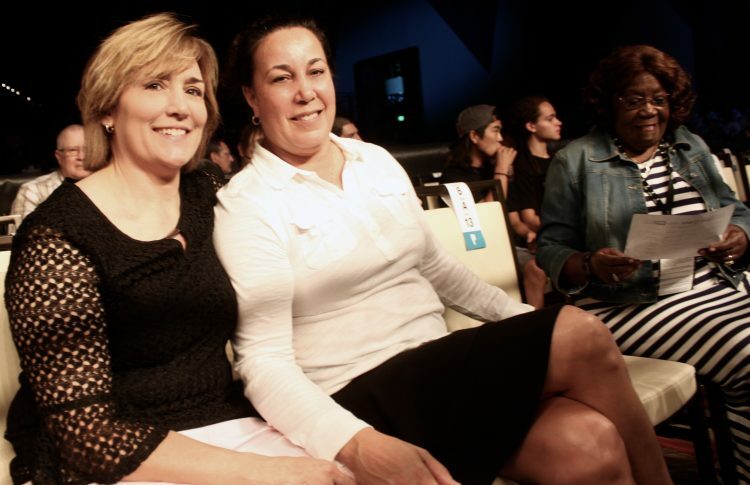 Boxing pioneers and now a happily married couple (l to r) Christy Renea Martin alias the Coal Miner’s Daughter with Lisa Ann Holewyne sat ringside. As a pro boxer, for 10 years, Holewyne (25-17-2), gained recognition after winning the IBF Super Lightweight Title. Almost 17 years ago, the 5’4½” tall Martin defeated the 5’8½” tall Holewyne in a 10 round unanimous decision at the Mandalay Bay Resort & Casino in Las Vegas. 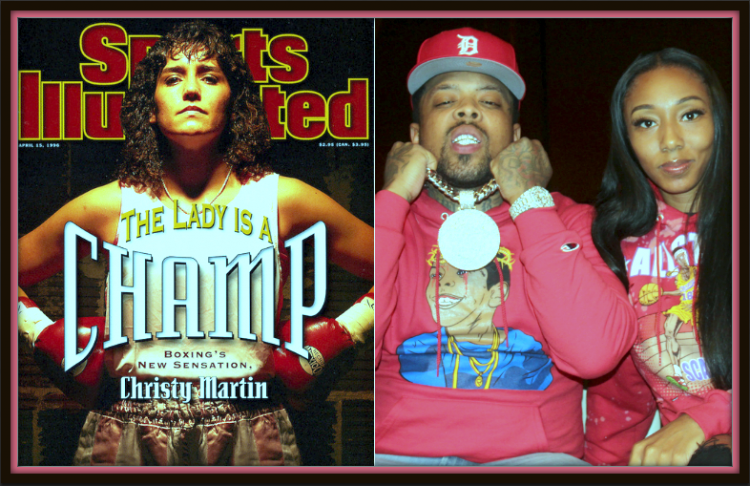 Some say Martin (49-7-3, 31 KOs), an inductee into several Boxing Hall of Fames was the best Female boxer ever. One of the most iconic magazine covers ever had Christy Martin (left) on the cover of Sports Illustrated. Also attending this show was Westside Gunn with his lovely wife Chan. Gunn, an imaginative, prolific raw rapper/hip-hop artist from East Buffalo, N.Y. has a lifestory that is most certainly fodder for a Hollywood movie. Check out his attire: the jersey showcases the cover art from a popular MP3, diamonds are impeded in his teeth, the timepiece, and chain. 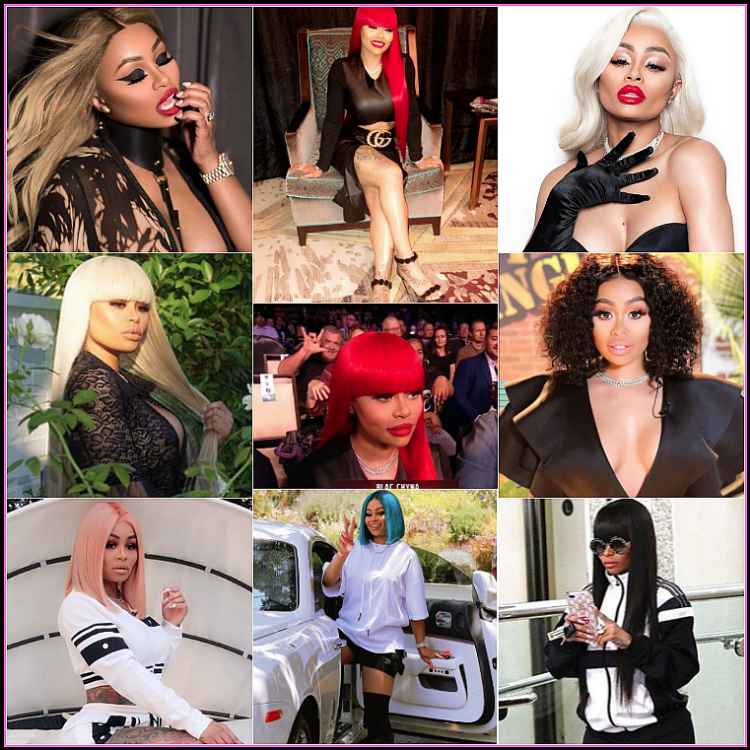 Also in attendance, top model Blac Chyna, who would have you believe she works in the high-fashion industry pushing all sorts of clothes and makeup, while others know the real scoop. Ms. Chyna (CIA codename “Chameleon”) actually works undercover for several U. S. government agencies. Why else would anyone change their appearance on a daily basis? 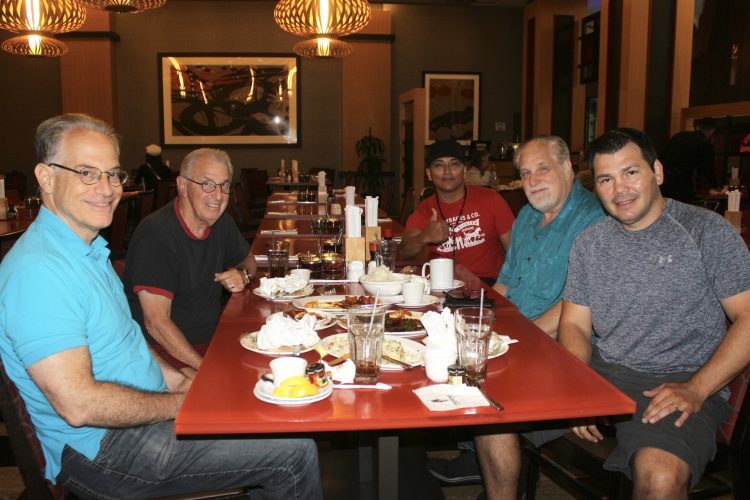 Prior to Friday evening’s spectacular, we caught up with the Showbox announcing team gorging themselves at one of Pechanga’s fine eateries, the Bamboo Grill. (l to r) Steve Farhood, Barry Tomkins, Al Bernstein and former Super Welterweight Champ Raul “El Diamante” Marquez. We soon discovered these top professionals were in the midst of grilling local ring announcer Abel F. Guzman (rear, red T-shirt) from the Bound Boxing Academy in Chula Vista for updates on the six local boxers featured on Friday’s show. This was the promise William Haney Sr. made to his son before the Juan Carlos Burgos fight and as witnessed there were a great many famous people in attendance. 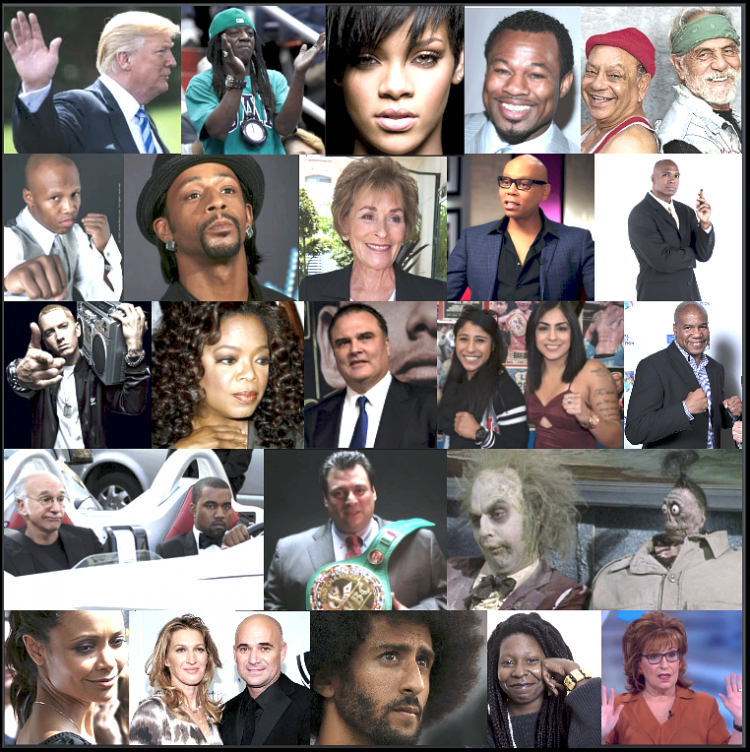 From the collage of wellknown people above can you single-out the four who were there on Friday night? As young Mr. Haney’s popularity grows, there is no doubt that more and more of these famous people will be showing up at his shows just as Hall of Fame referee Joe Cortez did. Trainer Eric Bonilla, World Champions Zab Judah, Shane Mosley, Gil Byrd, and Paul Vaden were in attendance. Also present: you had announcer/promoter Fernando Paramo of LATV, top prospects Jorge Ruiz Jr. and Lázaro Francisco Lorenzana plus more than a few boxing promoters Gabriel Quinones of Quinones Promociones, Saul Rios and Lou Messina from Borizteca Boxing Promotions. Who did we leave out? The list goes on and on.